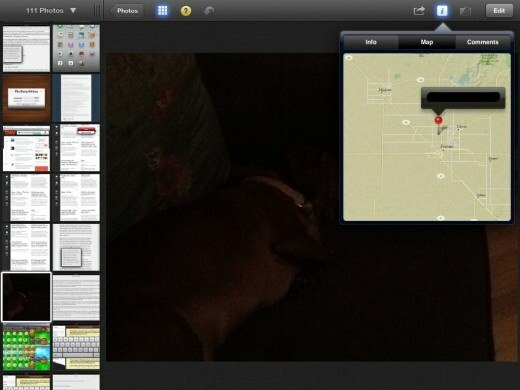 The new iPhoto for iOS does not use Google Maps. The tiles brought up when you use the locate feature of iPhoto, in order to display where the photo was shot, almost definitely do not have the traditional Google Maps in the Maps app of iOS. Update: OpenStreetMap has confirmed Apple uses an older version of its mapping data. This may be a new indicator that Apple is planning on removing Google’s map information from iOS entirely. As of now, Apple provides its own map solution, but uses data licensed privately from Google. This could be Apple’s way of testing out its new maps product before it goes live in the Maps app of a future version of iOS. Since then, Apple has continued to make small purchases in the mapping arena,snagging Google Earth competitor Poly9 in July of 2010 and wicked 3D mapping company C3 Technologies in August of this year. During the location tracking brouhaha earlier last year, Apple mentioned that it was gathering anonymous data for an ‘improved traffic service’ that it would be able to offer iPhone users within the ‘next couple of years’. This traffic service would provide an Apple-supplied layer of traffic data on maps, rather than Google’s. This layering of map data was one of the core technologies of Placebase’s mapping technology. It is likely that this traffic service will be aided by the additional accuracy of the iPhone 4S GPS system, which now incorporates Russian GLONASS satellites. The mapping deal was renewed as recently as this year according to Schmidt, but once again, no one knows the time period involved. You can bet that Apple was thinking about just how much work it had to do on its own solution when it extended the deal though. Having Google Maps not appear in the iOS version of iPhoto is far from conclusive evidence that Apple is dropping Google as a maps provider, but it does add one more piece to the puzzle. 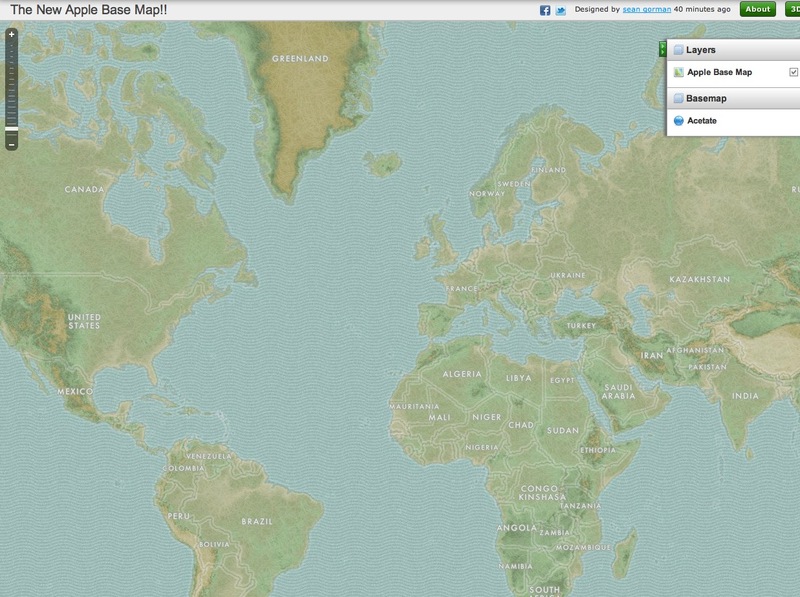 Update: We have confirmed with Microsoft that this is not a Bing map solution. 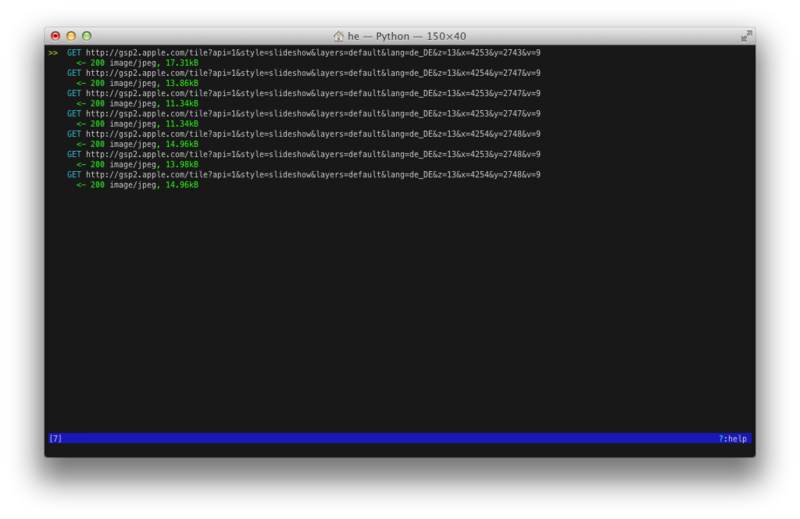 I’ve also compared it to OpenStreetMap’s tiles and the images are definitely not coming from there. This is a conclusion also reached by Stephen Hackett of 512px, who noticed the maps not coming from Google as well. It is always possible that the actual mapping data is coming from OpenStreetMap data, we’re looking into it. John Gruber of Daring Fireball asked Apple about the maps and Apple said that the ‘maps data’ was coming from Google Maps. This just doesn’t match up to what we’re seeing to be honest. Sean Gorman and Andrew Turner have now posted a full version of the map layer Apple uses in iPhoto for iOS up on GeoCommons. 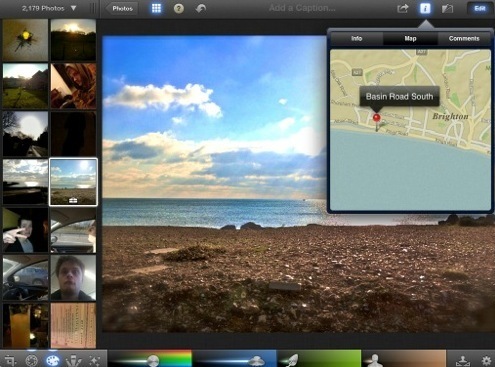 The map, says Turner, is not up-to-date enough for navigation use, although it is fine for the imprecise ‘photo location’ services it is used for by iPhoto. This would imply that this mapping layer could not be used in navigation or high-end mapping via the Maps app on iDevices without updating or additional levels of detail. Honestly, it looks like this particular chunk of data was designed to look nice as a display element inside Apple’s apps, not as a standalone mapping solution. Gorman points out that you can even use the tiles with other mapping data using the endpoints here. Still, it does mark the second product, after iPhoto for Mac, that Apple is using its own solution for, rather than Google Maps. Update 2: TNW reader Jonas Häggqvist wrote in to us saying that he has found correlations between the data in the iPhoto maps app and OpenStreetMap’s maps data, but says the data is from early April 2010. …this street was added to OSM on March 28th 2010 is on the map, while this street, which was added on April 6th, is not. In addition, it looks like they use a different source for toponyms, and for water features in the US (possibly an NHD dataset).